If that seems like a lot of disparate responsibilities, think of it this way: civil affairs specialists are public relations officials who work with civilian and military liaisons to ensure the safety of both soldiers and civilians, as well as the success of military operations. This important role is categorized as military occupational specialty (MOS) 38B. In the Army, the main role of civil affairs specialists is to prevent and mitigate civilian interference with military operations. 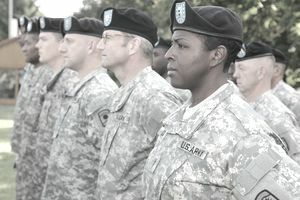 Civil affairs soldiers help plan missions that may involve civilians, such as evacuations, and work with civilian aid agencies, non-governmental organizations (NGOs) and commercial and private organizations. They may also support counter-drug operations that involve civilians or non-combatants. Teams of civil affairs soldiers support both conventional and special operations forces and identify the needs of local citizens in combat or crisis situations. They also locate civil resources to support military operations, deal with any incidents or injuries to non-soldiers, help with humanitarian relief efforts and act as liaisons to civilian agencies such as the Red Cross. A civil affairs specialist also researches and coordinates the planning and production of civil affairs documents, such as press releases. Also, civil affairs soldiers may help plan government interagency procedures in the event of a national or regional emergency situation. Coordination of military resources to support activities like reconstitution or reconstruction and support of national disaster, defense or emergency assistance and response activities are also among civil affairs' duties. The primary role of civil affairs specialists is fostering and maintaining communication with civilian aid agencies and act as coordinators in the event of emergencies. It is particularly crucial in situations where political and economic systems are incapacitated, such as a natural disaster like an earthquake or hurricane. Job training for a civil affairs specialist begins with the usual ten weeks of Basic Combat Training (boot camp), followed by 13 weeks of Advanced Individual Training (AIT). You'll need at least a 96 on the skilled technical (ST) portion of the Armed Services Vocational Aptitude Battery (ASVAB) tests. And since you'll be handling sensitive information, you'll need to be able to qualify for a secret security clearance from the Department of Defense. It involves a background check of your police record and finances. Past drug or alcohol abuse may disqualify you from this MOS. Also, civil affairs specialists must be U.S. citizens and have no record of conviction by court-martial and no record of conviction by civil court for any offense other than minor traffic violations. An equivalent civilian job to civil affairs specialist would be that of an emergency management specialist: someone who acts as a liaison among various agencies and organizations during a crisis situation to ensure a positive outcome with minimal casualties for all parties.